OH-KAY! Wow. What an adventure this has been so far. I used Amanda’s tutorial on Design Sponge as a guide for this next project. I’m so glad she made it easy to follow. However, my experiences thus far have been less than exasperating. Here is the before picture. No, there is nothing majorly wrong with the color of the seats. I like them. However, if I left the seat covers this color my house would be plain vanilla. I needed color without painting my walls a demanding color (in this case, green). 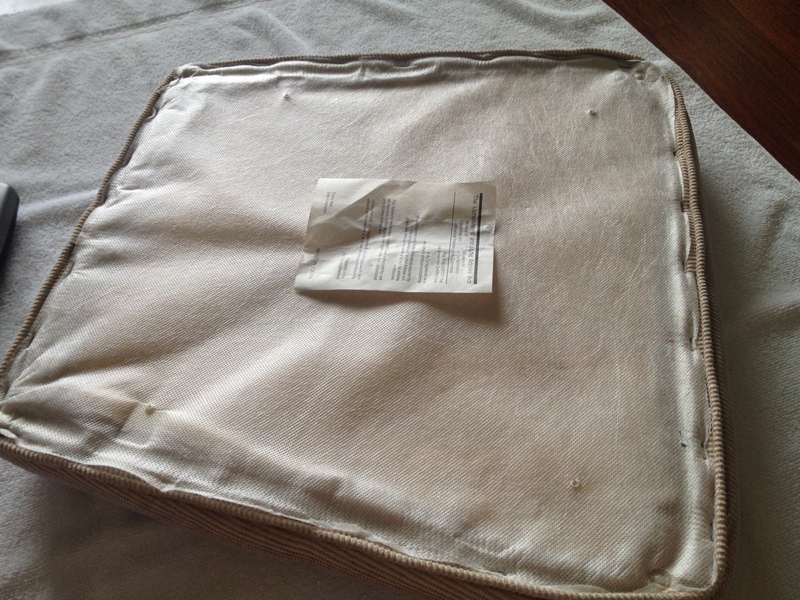 Some of the chenille seat covers were snagged, others beginning to be threadbare. 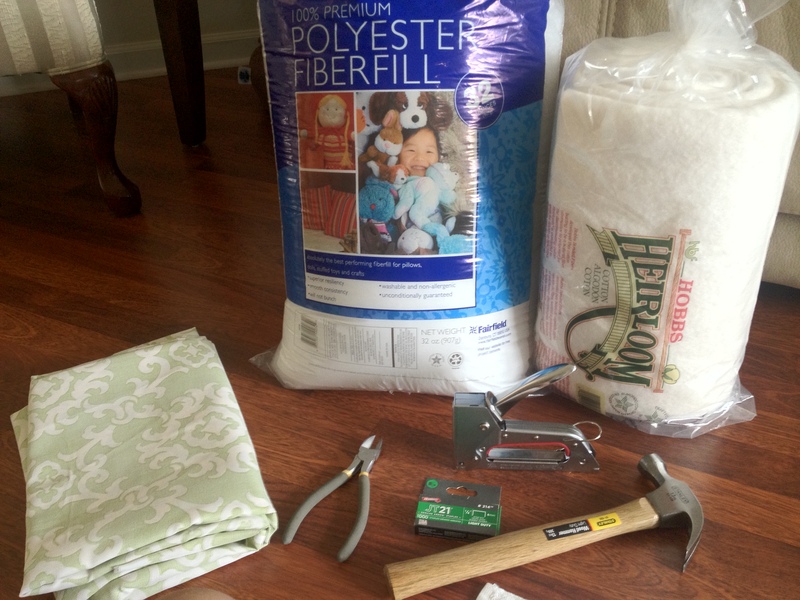 These are the materials I started with: cotton batting, a hammer, wire cutters (for lack of a flat head screwdriver), fabric, staple gun, staples, and poly fill (I’ll explain that one in a bit) and a small Philips screwdriver. First, remove the nails underneath holding the chair seat to the frame. I used my Philips screwdriver. 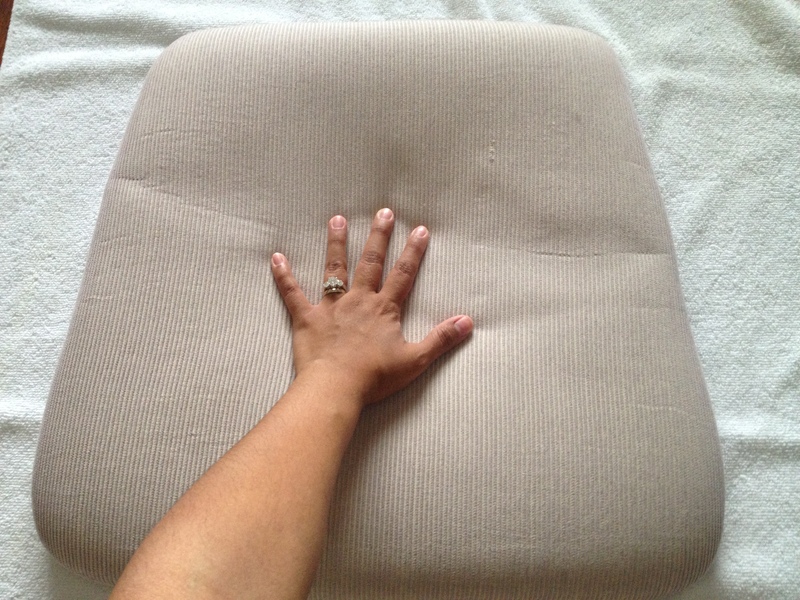 The most annoying (and dire) aspect of this reupholstering project was the deteriorating foam padding underneath the seat cover. 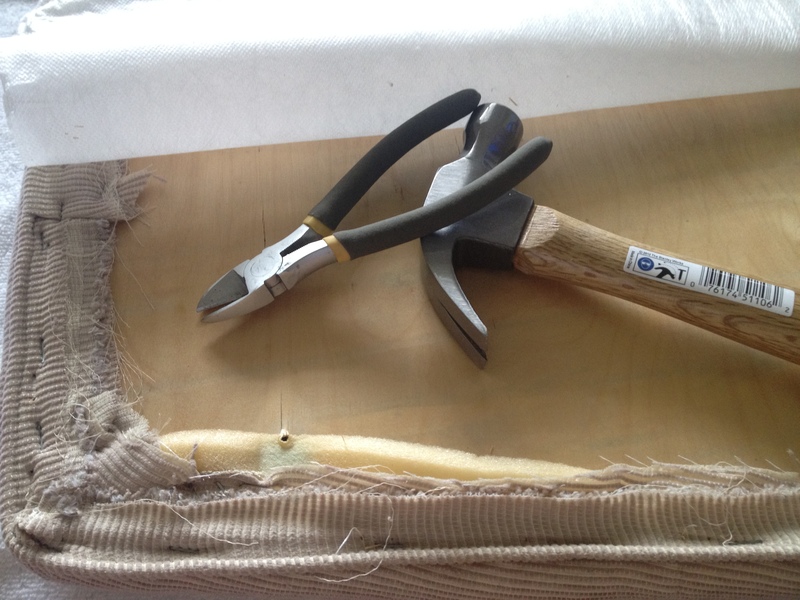 In the picture below, my hand is laying on the seat…and I can actually feel the wooden board through the layer of padding and fabric. Yuck! A JoAnn Fabric employee suggested I buy poly fill to correct that hole of deteriorating foam in the middle of the seat. (Fast-forward temporarily to poly fill. D-I-S-A-S-T-E-R. Like a badly-stuffed sausage!) She meant well, though! 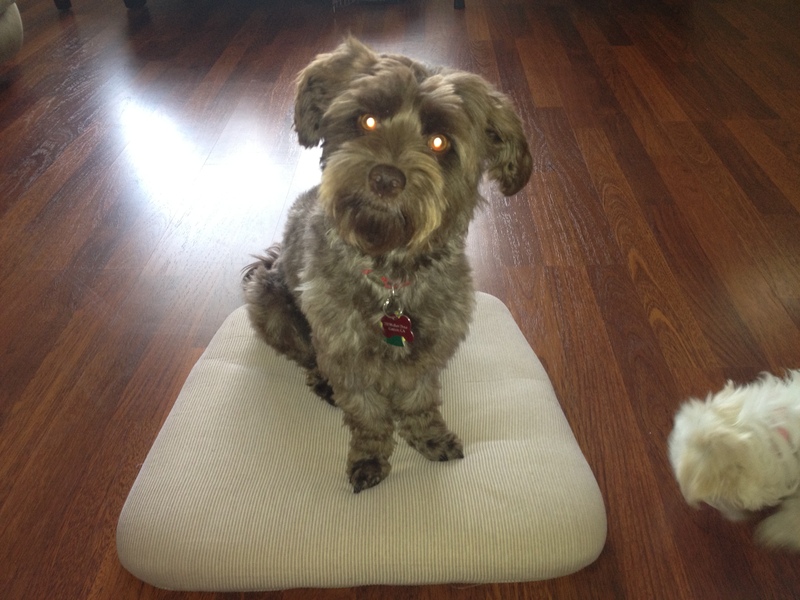 I returned the poly fill and bought four 2″ high density foam pads measuring 15″ x 17″. 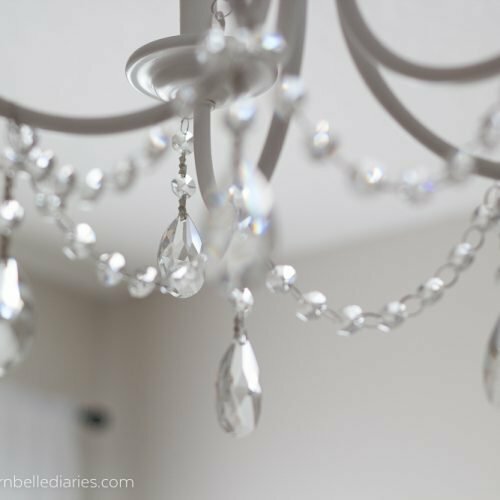 Turn your seat upside down to see what surprises await you! I had to bring out the wire cutters because the back of the hammer was not working. Can you believe that JoAnn didn’t carry staple removers? 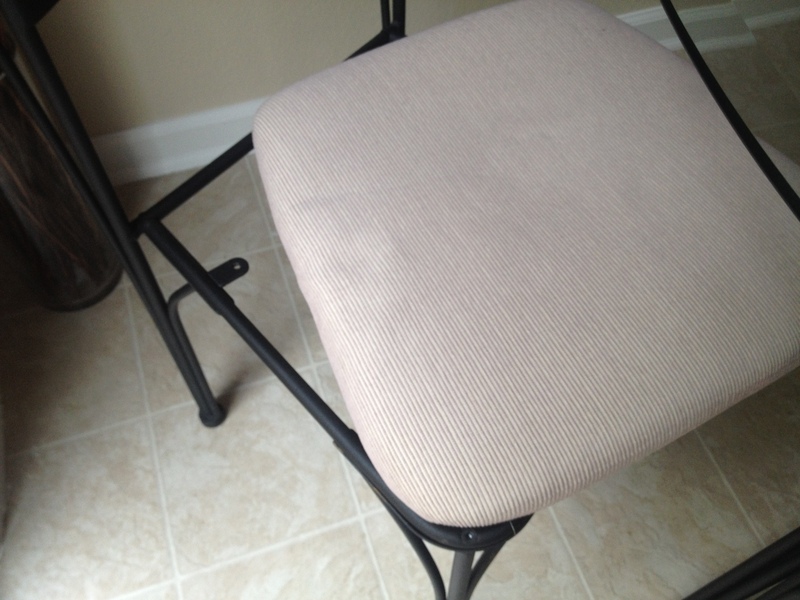 The cording around the edge of the seat was actually a second layer under the dust cover. It was stapled on after the seat chair fabric. That meant there were double the staples to remove. (I almost fainted inside). At this point I was removing staples for over an hour. My puppy was very curious as to what I was doing. He also was asking for attention. Look at all those staple holes! It took over 2 hours to remove them all. Some of them were rusted inside the wood, so they broke into several pieces during the process. Not fun. 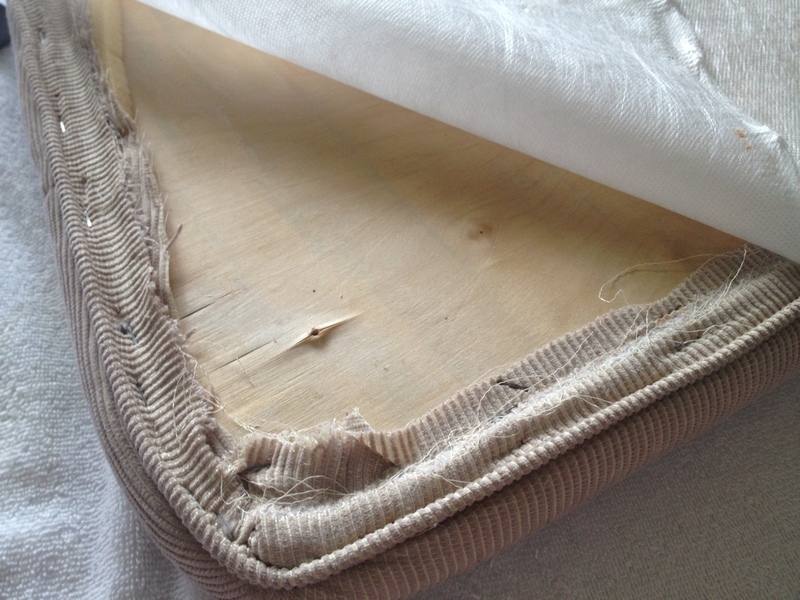 If your cushions are good, I recommend you skip this process and just cover over everything and save yourself the headache! 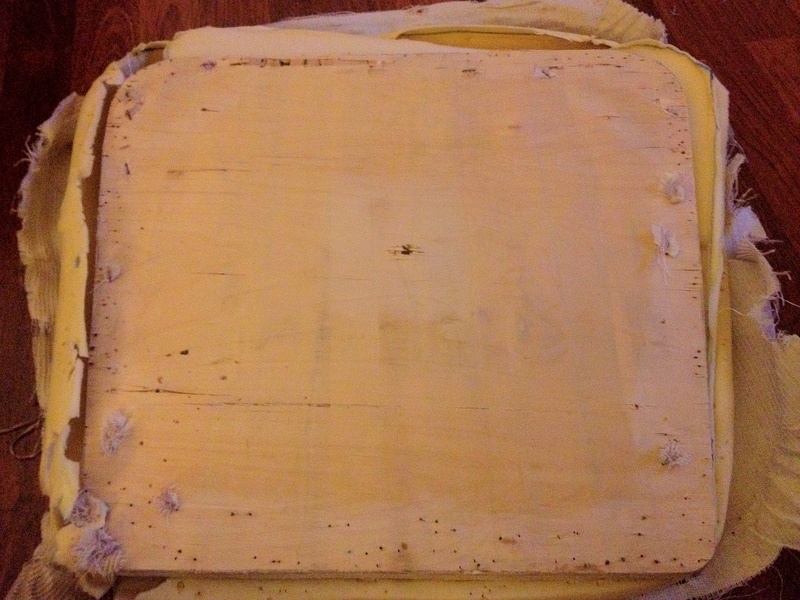 My next step was measuring up the foam up against the wood seat. Imagine my surprise when the foam that I thought would be too big all around actually didn’t measure up! 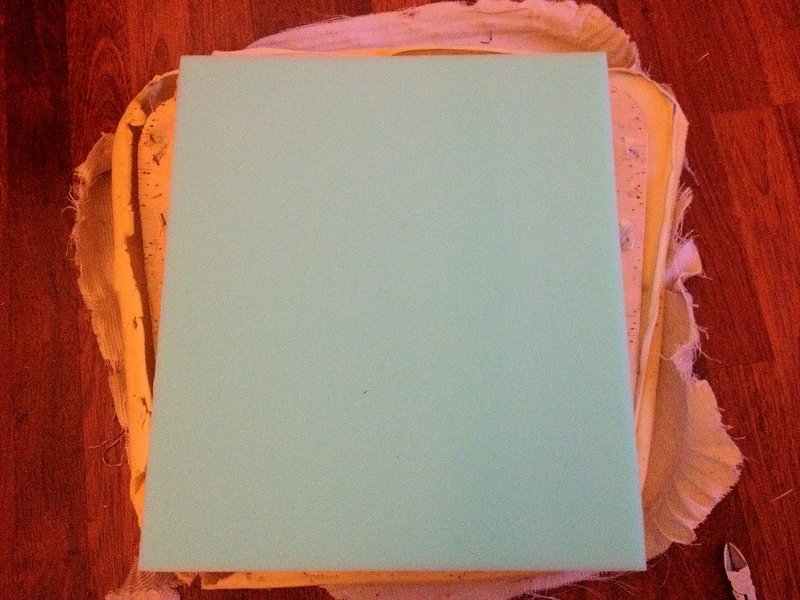 That was 2″ high density foam that I bought at 50% off at JoAnn Fabric. Wait for the 50% ALL FOAM sales they throughout the year. Also, they often have 20% coupons for your ENTIRE purchase. 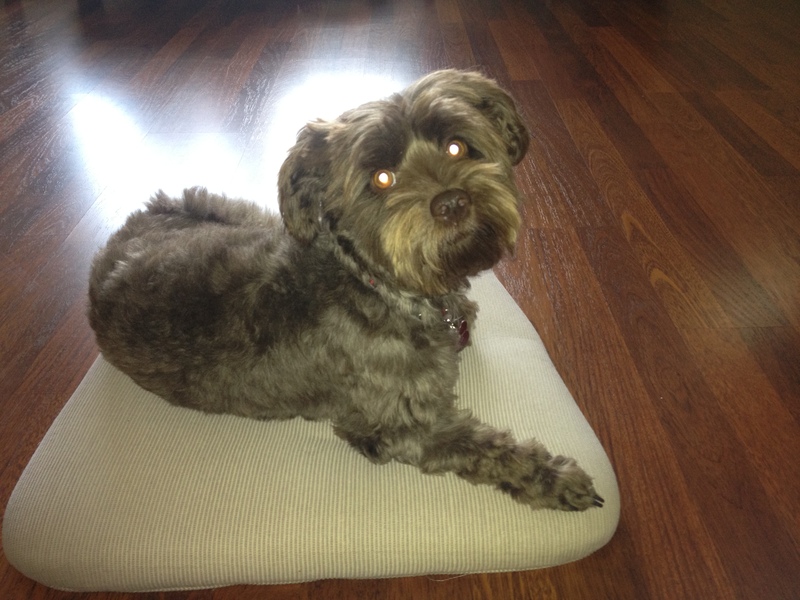 I am going to have to return these foam chair seats (they ended up being just under $18 with my coupons) and try again. I discovered that the manufacturer used 1/2″ foam in two layers: one with the exact dimension of the wood, a second that covered the edge and went over the lip, giving that nice rounded corner look. 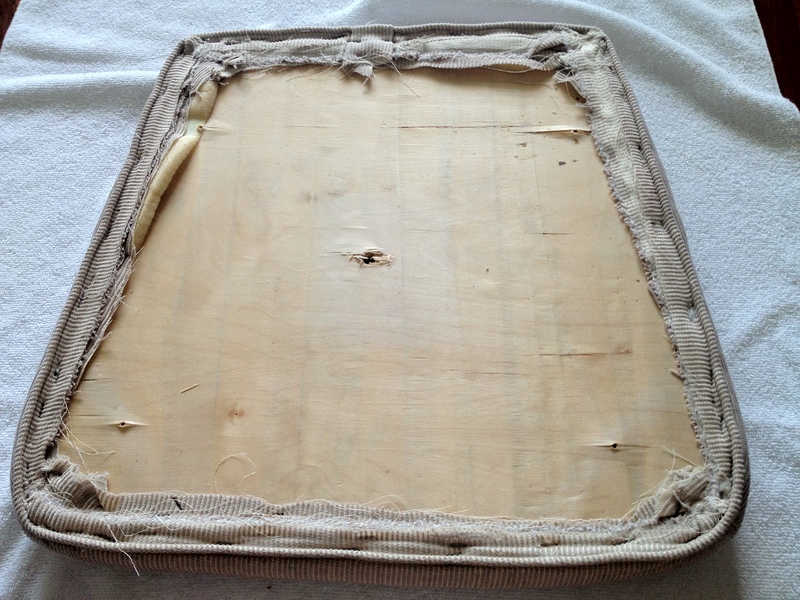 I will be doing just this, but with 1″ thick foam covering the top and another 1″ thick sheet going over the edge. You don’t want to feel the wood. After that, I will cover the foam with batting to give an added layer of cushioning and smoothness to prepare for the fabric. 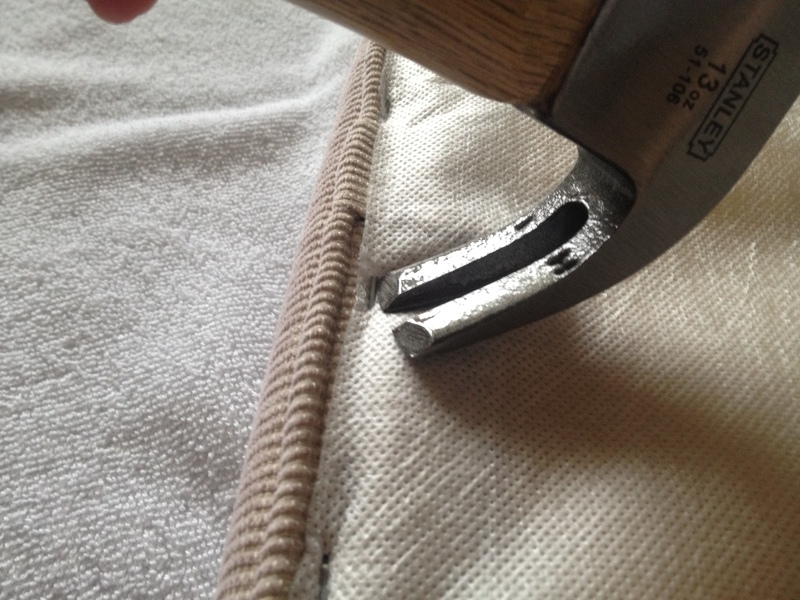 Have you ever tried reupholstering anything yourself?